Holon, Israel – August 4, 2016 – Sapiens International Corporation, (NASDAQ and TASE: SPNS), a leading global provider of software solutions for the insurance industry, with a growing presence in the financial services sector, and a member of the Formula Group (NASDAQ: FORTY and TASE: FORT), today announced its financial results for the second quarter ended June 30, 2016. 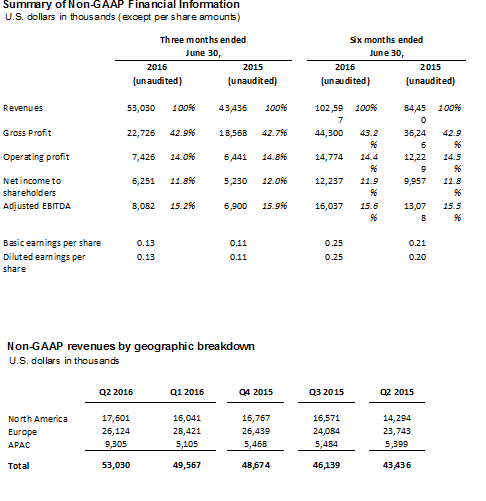 GAAP Revenue of $53.0 million, up 15.1% compared to $46.1 million in the second quarter of 2015. Non-GAAP revenue of $53.0 million, up 22.1% compared to $43.4 million in the second quarter of 2015. 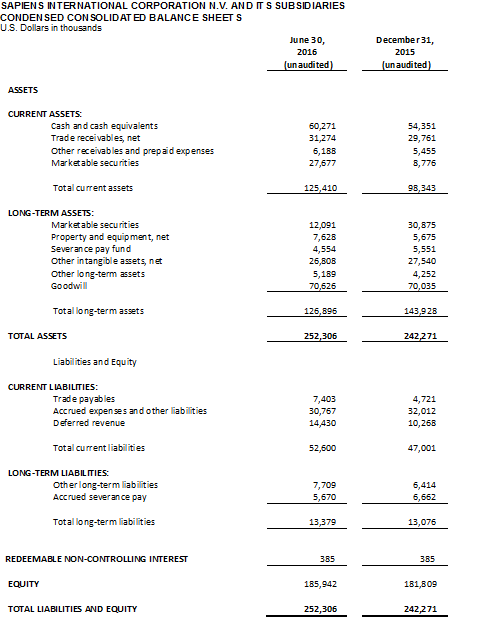 Cash, cash equivalents and securities investments as of June 30, 2016 was $100.0 million, following the distribution of a cash dividend in the amount of $9.8 million. The company has no debt. GAAP Operating profit increased by 6.3% and totaled $6.4 million (12.1% operating margin), compared to $6.0 million (13.1% operating margin) in the second quarter of 2015. Non-GAAP operating profit increased by 15.3% and totaled $7.4 million (14.0% operating margin), compared to $6.4 million (14.8% operating margin) in the second quarter of 2015. 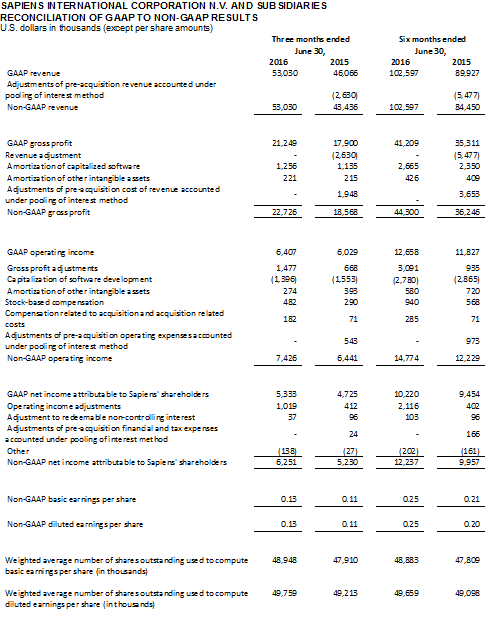 GAAP Net income attributable to Sapiens’ shareholders totaled $5.3 million or $0.11 per diluted share, an increase of 12.9% compared to $4.7 million or $0.10 per diluted share in the second quarter last year. 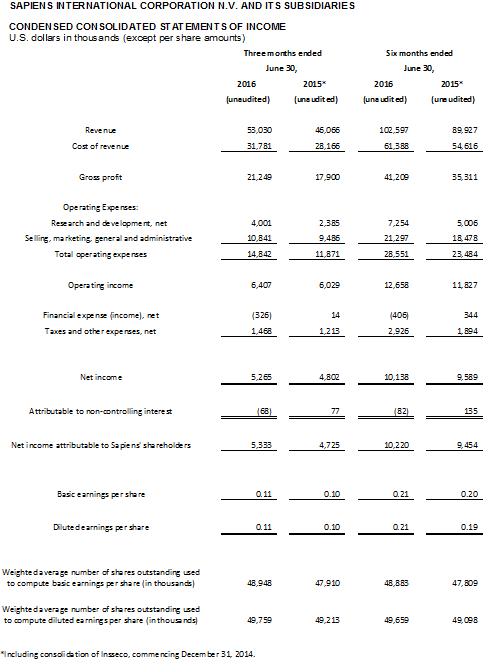 Non-GAAP net income attributable to Sapiens’ shareholders totaled $6.3 million or $0.13 per diluted share, an increase of 19.5% compared to $5.2 million or $0.11 per diluted share in the second quarter last year. “We saw strong double-digit growth and improved performance across our offerings and across all of our territories, driven by strong demand from existing customers and from ramping sales from new customers. As in recent quarters, the demand for our products and services remained strong,” said Roni Al-Dor, President and CEO of Sapiens. Mr. Al-Dor continued. “On the deal front, during the second quarter we signed a multimillion expansion with Anadolu Insurance Company, a private insurer operating in Turkey. As in many of our other strategic relationships, this win was part of a larger transformation project. We view this expansion as yet another key example of how our solutions can help our P&C client base grow and mature over time as they consolidate their multiple lines of business on a single platform, namely our IDIT software suite. Mr. Al-Dor concluded: “Based on the strength of our first half growth and our outlook for the remainder of the year, we are raising our guidance to 2016 full year non-GAAP revenues of $211 to $215 million, or annual growth of 18%-20%, up from prior guidance of $207 to $211 million. North America: 1-888-269-0005; International: +972-3-925-5929. The Company defines adjusted EBITDA as net profit adjusted for stock-based compensation expense, depreciation and amortization, capitalized internal-use software development costs, amortization of internal-use software development costs interest expense, compensation expenses related to acquisition, acquisition related costs, pre-acquisition revenues and expenses accounted under pooling of interest method, provision for income taxes and other income (expenses). These amounts are often excluded by other companies to help investors understand the operational performance of their business. 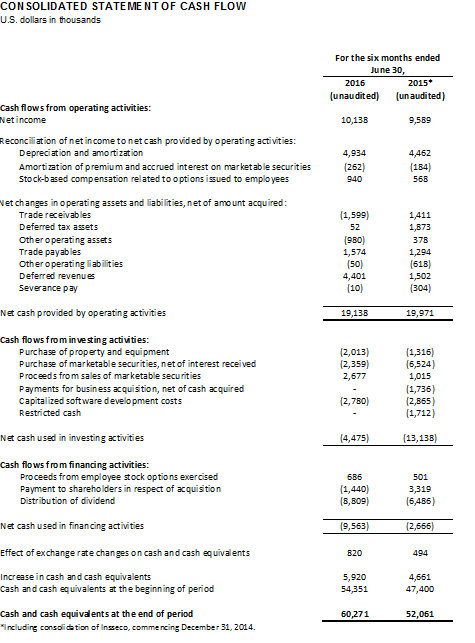 The Company uses Adjusted EBITDA as a measurement of its operating performance because it assists in comparing the operating performance on a consistent basis by removing the impact of certain non-cash and non-operating items. 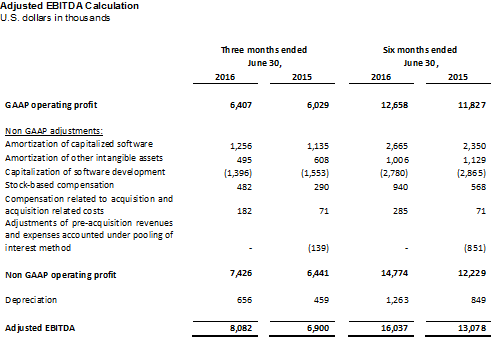 Adjusted EBITDA reflect an additional way of viewing aspects of the operations that the Company believes, when viewed with the GAAP results and the accompanying reconciliations to corresponding GAAP financial measures, provide a more complete understanding of factors and trends affecting its business. Sapiens International Corporation (NASDAQ and TASE: SPNS) is a leading global provider of software solutions for the insurance industry, with an emerging focus on the broader financial services sector. We offer core, end-to-end solutions to the global general insurance, property and casualty, life, pension and annuities, and retirement markets, as well as business decision management software. We have a track record of over 30 years in delivering superior software solutions to more than 200 financial services organizations. The Sapiens team of approximately 1,800 professionals operates through our fully-owned subsidiaries in North America, the United Kingdom, EMEA and Asia Pacific. For more information: www.sapiens.com.